Emotions for Engineers: Is Vitamin D a Silver Bullet? Is Vitamin D a Silver Bullet? I am not a big believer in "silver bullets." But that belief system may be changing for me. If you're not aware, much of the blogosphere, especially low-carb. primal, and/or paleo blogs have been abuzz about the importance of Vitamin D in preventing sickness and disease. So, it turns out that Vitamin D is not technically a vitamin. It is a steroid hormone or prohormone. Your body is theoretically capable of creating all it needs in your skin from sunlight (specifically UVB rays), but in wintertime, far from the equator there is not enough sunlight. It is a likely driver of skin color--the reason that those who live near the equator have darker skin than those closer to the poles. 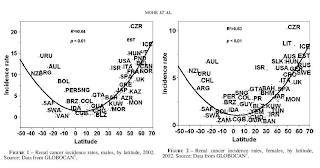 It is why so many people get sick in the winter, yet are healthy all summer, and a likely reason that latitude is a good correlation with cancer incidence. I have a multitude of links below, but I would like to share my experience from the past few months. I have been supplementing my vitamins with Costco Vitamin D3 tablets. Each tablet is 1000 i.u. These are dry tablets and I want to note that I have seen some recommendations to take oil-based gel caps for more reliable absorption. In a typical winter, I get 2 - 4 colds, each one lasting a good week, requiring tons of Nyquil, Dayquil, Mucinex, etc to help get me through. Typically, I would feel some scratchiness in the back of my throat. That would progress to stuffy nose, and soon after down to my lungs. This winter has been different though. I was typically taking about 4000 i.u. per day. When I felt the scratchy throat (two or three times this year), I'd double it for a few days. About a week ago, my daughter was visiting me on spring break. I was a little lax with my Vitamin D--probably missed a day or two. I felt the throat scratchiness and for some reason attributed it to allergies, so I didn't increase D.
The scratchy throat on Wednesday had progressed by Friday to bronchitis. I felt like death warmed over. My doctor told me that it would get worse before it got better. When I went home after the doctor, I took 10,000 i.u. of my Vitamin D as well as some mucinex, (which I had already been taking). By the next day, I felt 100% better (I took another 6,000 i.u. of Vitamin D) and by Sunday morning I felt almost well. I can't recall ever recovering from a cold this quickly. The usual caveats apply. I am an n of 1, and there may be a placebo effect, but I am amazed at how I have felt this winter. A recent study states that the evidence for Vitamin D is strong enough that it should become a recommendation for cancer prevention and treatment. PubMed, sponsored by the United States National Institutes of Health has hundreds of papers linking latitude and cancer, latitude and flu, seasonality and disease. The thread running through it all is, the less sunlight, the more disease. Melanoma rates are increasing despite record amounts of sunscreen being used. It turns out that sunscreens filter UVB rays well, but in the past have not done a good job of filtering UVA. UVB causes sunburn and is the driver of Vitamin D synthesis in the body. UVA rays are a big driver of melanoma (the most deadly skin cancer) and other skin disorders. Part of the increase in skin cancer may be due to the false security and comfort from sunscreen, leading people to be in the sun more. I believe that another part is likely due to the dampening effect on Vitamin D production. Could that be creating higher risks for other cancers as well? It is apparently unusual to get a Vitamin D overdose from the sun. From the Wikipedia article on Vitamin D. "Exposure to sunlight for extended periods of time does not normally cause vitamin D toxicity. This is because within about 20 minutes of ultraviolet exposure in light skinned individuals (3–6 times longer for pigmented skin) the concentration of vitamin D precursors produced in the skin reach an equilibrium, and any further vitamin D that is produced is degraded. Maximum endogenous production with full body exposure to sunlight is 250 µg (10,000 IU) per day." Here is an excellent article from 2000 from the Medical College of Wisconsin. Here is an older article (the recommendations do not align well with the explanatory text, but the explanatory text is good). Here is an MSNBC article warning that "sunscreen has not been conclusively shown to protect against melanoma..." Richard at FreeTheAnimal did this sunscreen post. So here's the e4e recommendation. Get your Vitamin D levels (25(OH) D, Serum 25 Hydroxyvitamin D) tested. If your doctor won't order the test, try Grassroots Health. Edit: I did a future post on which vitamin D test to get. If your levels are below 40-60 ng/ml, take a Vitamin D3 supplement. People with darker skin and those who do not spend much time outdoors are more likely to have low levels of Vitamin D.
If you don't get the test, but find yourself having lots of colds and upper respiratory tract issues, take a vitamin D3 supplement try 4,000 i.u. for a few months and see if your health improves. This is especially important in the winter months. There appears to be little danger of Vitamin D toxicity. Do not fear the sun, but treat it with respect. Try not to burn, cover up, develop a tan when the sun is less intense during the day. Some unprotected sun is ok, but don't overdo it. Can Vitamin D Help Prevent Swine Flu? Pubmed. An incredible resource for research abstracts. Yes!! I scooped the Washington Post. Your experience with Vitamin D and a cold has been replicated by myself several times, along with other family members. And of course you can find thousands of similar anecdotes on the web. It makes perfect sense, as Vitamin D helps regulate the immune system cells that attack the cold. When you're deficient, they attack your own cells as well. Vitamin D also upregulates your body's own production of antibiotics. Thanks Dave. There are so many studies out there that demonstrate such strong correlations. That's a really interesting video. Correlation is not causation, but it all makes so much sense. One of these days (when I'm rich and have nothing but time for this sort of stuff) I want to do a Bayesian study of the correlation/causation thing. It will be interesting to see if you have enough correlations (e.g. from various different diseases to Vitamin D) if you can every build a case for causation. BTW, I had my Vitamin D levels tested and it came in at 52 ng/ml. Unfortunately it was in June, rather than a lower point like March. But it is a data point. I found your post interesting. 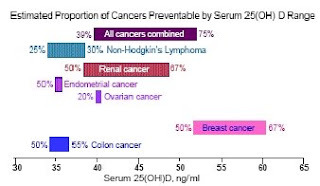 I must point out that your D serum count of 52 is right at the "magic number" cited in so many studies, especially those from the fields of cardiology and cancer research. People who were below 52 ng/ml had cardio events/cancer and disease more often than those above 52 ng/ml. For this reason many experts are recommending you serums be maintained at 60 to 100 ng/ml. You should also consider the fact that your serum was at this level during optimum UVB levels. This means that you are most likely dipping into deficient levels during the winter. This cycle is the reason that so many men have heart attacks in the winter - heart attacks in general peak in the winter, along with colds, flu and decrease in spermatogenesis. (I'm not a doc, btw). PS - are you sure your serum test is a result of the proper test? (25 hydroxy and not 1,25 vitamin d test that is so often given and is incorrect for reading D levels - there are 3 ways to test D and only one is correct in the context of the current research. The numbers sighted for serum levels are referring to 25 hydroxy levels. Many docs/labs are still getting this wrong. Hi Donovan, thanks for the feedback on this. I take between 4000 and 8000 iu per day of Vitamin D in the winter. I think it helps. I had a cold earlier this winter, and I had one coming on this week, but I upped my dosage to 10-20,000 and think I headed it off. I agree on the tests, it is confusing, In fact, my doctor originally prescribed the wrong one. I called and got it changed before I wasted time money and effort on that. When my wife went to get hers, I checked to make sure that they had prescribed the right one and in fact I blogged about it on e4e a few months back.